Before I moved to Hamburg almost 4 years ago my association with Turkish food was small fast food joints where one would stop for a quick bite after a long night of partying. But then I discovered Turkish restaurants with their wood ovens, meats marinated to perfection, superb bulgur side-dishes, and plenitude of fresh and grilled veggies. To every meal I would order a big glass of Ayran – a refreshing salty yogurt drink. In fact, hubby and I like ayran so much that from time to time we would also buy it in the grocery store. Last weekend, while emptying our small and overpriced containers of ayran after having finished the weekend shopping, we begun to wonder: would it be difficult to make ayran ourselves? 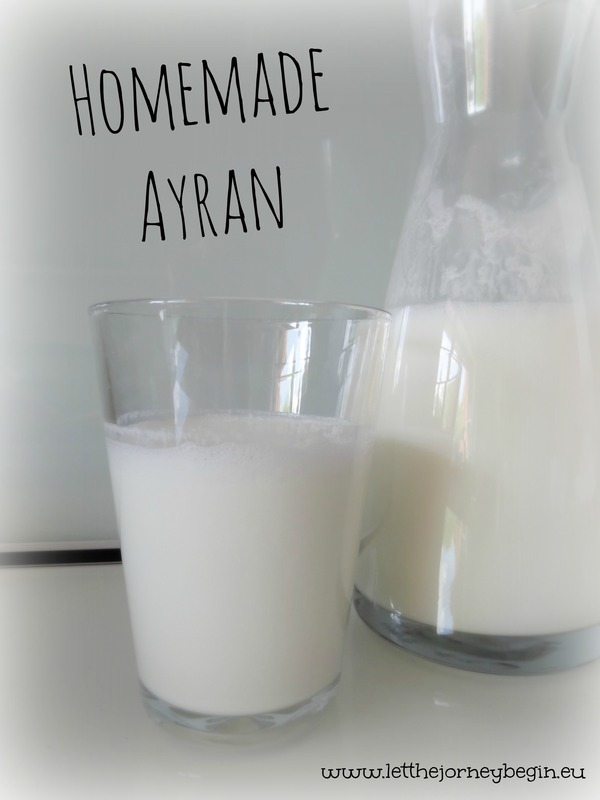 A quick search showed that, indeed, it would be very easy to make ayran at home. And, in addition to getting large amounts of the perfect drink for the (hopefully) upcoming hot summer days, it would also save us quite a bit of money compared to buying ayran at the store. So, right in time for the sunny and warm Pentecost weekend, here’s the recipe for a homemade ayran. The instructions are super simple and straightforward: pour the yogurt and water in a blender or a mixing bowl and mix for a minute or so until well blended and foamy on the top. Check the thickness: if you’re using the 10% fat yogurt you might want to add a little more water. Finally, add sea salt to taste.